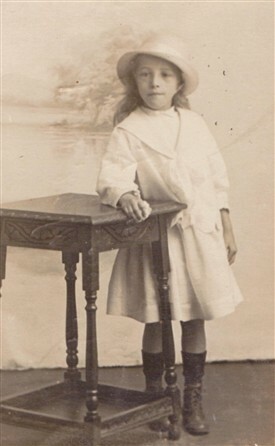 Tom Flower's younger sister, Elsie, aged 7 in 1917. On the back of this photos is written "To dear Tommy from Elsie with best love July 28th 1917"
Back in 1953 a house purchase in Radcliffe-on-Trent brought with it a charming set of slim wooden drawers, made for the storage of sheet music. For many years thereafter these drawers did service as a sewing box, and discovered in the bottom of one of them was a small collection of documents, letters, and family photographs dating from the First World War. The papers are related to a Lance Corporal Thomas Flower who served with the 9th Battalion Sherwood Foresters in the trenches of Flanders from the earliest days of the war, being wounded and invalided back to Blighty in 1915. Recuperating in hospital, Tom Flower received letters from his sisters back home in Radcliffe and from his mates still out in the trenches which, today, give a remarkable insight into one man's experience of the Great War. From the Census returns of 1901 and 1911 for Radcliffe-on-Trent, Nottinghamshire, we can trace something of Tom Flower's early life. He was born in c.1895 in Radcliffe to Thomas (b.1865) and Elizabeth (b.1862) Flower, his father being a carpenter/labourer for the railway. The family lived first (1901) at Ogle's Yard on Knight's Hill in Radcliffe, having moved by 1911 just around the corner to the row of houses known as Mount Pleasant. 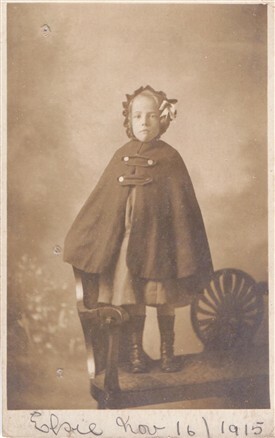 Tom was the fourth of seven children, including one stepchild, Rosa Bell, (b. 1887) who by 1901 was working as an errand girl in Radcliffe. Thomas and Elizabeth's other children were Mary Jane (b.1891); Elizabeth (b.1893); Thomas (b.1895); Emily (b.1899); Frank (b.1904) and Elsie (b.1910). As we shall see in what follows, and judging from the letters found in the chest of drawers, Tom would appear to have been especially close to his older sister Elizabeth (Liz). In 1911, Tom (now aged 16) was already out working for a living, being described in the Census of that year as a "Garden boy, domestic". Presumably this was in Radcliffe as he is still shown as living at home at Mount Pleasant with his family. Following the outbreak of hostilities in August 1914, Tom Flower, as a trained soldier in the regular army, found himself sent to France as part of the British Expeditionary Force (BEF). He arrived Le Harve on 4th November 1914 (See Document 1 below). 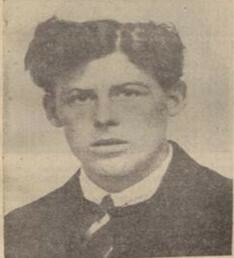 In 1915 Tom was invalided back to England. He was reported (in the Army Daily Casualty Lists) as having been "wounded" on 22 May 1915, although he did not appear in the List until 8th June 1915. The 1st Btn. returned from India, arriving at Plymouth, England, on 2nd October 1914. They then re-embarked for Le Havre, France, arriving on 4th November 1914. A letter sent by the Command Depot of the Sherwood Foresters in June 1915 states that Tom Flower had, for a period, been a patient at the Manchester Hospital and had afterwards been on Sick Furlough at his home in Radcliffe-on-Trent (See Document 2 Below). Upon being passed fit for Light Duties he was issued with a railway warrant and ordered to report to the 3rd Reserve Battalion of the Sherwood Foresters based at Sunderland. Agnes Day, born 8th April 1896, is listed in the 1911 census (aged 14) as the daughter of John and Mary Day of Leighton in Huntingdonshire. 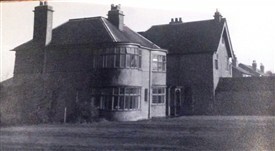 By 1915 letters show that she was working in service at a house, "Fenimore", in Radcliffe-on-Trent. "Fenimore" - a 14 room mansion in the Harlequin area of Radcliffe - was the home of George Mather, a successful lace manufacturer in Nottingham (Kellys Directory, 1916). Mather employed two servants, a general domestic and cook. Was it whilst at "Fenimore", that Agnes met Thomas Flower during his convalescence..... and had he perhaps been the gardener's boy at "Fenimore"? In the years following, it would appear that Agnes' mother and father back in Huntingdonshire suffered bouts of ill health and Agnes spent periods of time back home looking after them. By 1917, in fact, she appears to have moved back southwards permanently and taken a position at "Oakleigh House" in Thrapston, Northamptonshire for Mr John Pashler, a partner in the firm of Pashler & Cheney, corn, cake [cattle], coal and seed merchants of Thrapston. There are letters in the collection from Mr Pashler to Agnes' mother, one expressing regret that Agnes had decided to leave his employ in early November 1917. No reason is mentioned for Agnes' departure, but could it have been due to what befell Tom at about this time.....? At the end of 1917 Tom was again on his way home to Mount Pleasant at Radcliffe, the WW1 Casualty Lists (dated 5th Nov. 1915) recording that 11787 Lance Corporal T. Flower had been wounded. A subsequent letter from his sister, Liz, reveals that he had sustained an arm injury. (See Document 3 below). A letter from his Aunt Ada, meanwhile, dated 7th November 1917, is addressed to him c/o Kenton Ward, St.Batholemews Hospital in London. (See Document 4 Below). A month later and he had moved to the 1st London General Hospital in Camberwell, where he received a letter from his mates still out in France in the trenches (See Document 5 Below). This letter, from his 'old chum', Pte. J. Wright, dated 9th December 1917, says "All the boys are allright [sic] in the old Platoon and they all wished to be remembered to you and wish you all the best of luck and hope you do not come out here again for a year or two.... [For] 6 weeks we have never been out of the line long together since that last stunt as you was in, old sport". Presumably, it was this "last stunt" in which Thomas sustained his arm injury. Tom Flower was discharged from the service aged 24 on 31st December 1917 as a result of his wounds*. He was still in hospital in February 1918, when his sister Liz again wrote to him, bringing him up-to-date with family goings-on. He was finally discharged from hospital on 14th May 1918. He received the Silver War Badge (No. 302-977) for the wounds he received in action. (* Dates stated on his listing in the Register of Silver War Badge recipients, 1917). The following year, 1921 (June quarter) saw the birth of their only son, John Thomas Flower. The birth was registered in the Bingham registration district indicating a move of the family back to Nottinghamshire. Tom Flower died in 1936 aged 41. His death was registered in the Nottingham Registration District: March Quarter, GRO ref 7b/655). A report in the Nottingham Evening Post of 20th February 1936 (p.9) records that Thomas Flower was a postman and died following a motor-cycle accident near Owthorpe. Agnes had a longer life, dying in 1983 aged 87 (June Quarter, Nottingham, GRO ref 8/615). Their son, John Thomas Flower, fought in the Second World War in the RAF (Coastal Command) and is mentioned twice in the Nottingham Evening Post. The edition of 7th April 1945 (p4) reports that acting Flt.Lt. J.T. Flower (aged 23), only son of Mrs and the late T. Flower,Harlequin, Radcliffe-on-Trent, is missing, whilst that of 17th December 1945 (p1) confirms him as a casualty of war. As no spouse is mentioned in the newspaper reports mentioned above, we assume that John Thomas Flower remained unmarried with no issue, meaning that, today, there is no direct descendant of Tom Flower, the First World War soldier whose letters were found at the back of the drawer. This page was added by Website Administrator on 08/10/2014.